Your pool is one of your favorite places. You retreat there after a long day to enjoy the cool water and relax with family and friends. Pools are an amazing amenity to any house, but you can go one step further by adding a top of the line, luxurious spa or hot tub to your property. Spas are a deluxe luxury, offering many benefits to your life and adding a warm place for you on those cold winter nights. There are several benefits to owning a spa or hot tub. If you are considering adding a spa to your Tampa Bay pool or outdoor area, you are making the right choice. Here are just a few of the benefits of making this addition. If you or a loved one has chronic pains and aches, then traditional exercise methods might not work for you. However, if you own a spa, then a whole new world has just opened up. Spas are a comfortable, relaxing way to do several low impact workouts that can get your mind and body in the right shape. Tub yoga and cardio exercises are just some of the great ways people are using their spas to stay in shape. Hot tubs provide substantial health benefits that work on your muscles and circulatory system. The pressure of the jets provides a deep massage that is able to encompass several different areas of your body. Also, the temperatures in the tub will open up your blood vessels, leading to improved circulation. Not only are spas enjoyable, but also actually improve your way of life. This is great for those in your life who suffer from debilitating diseases like arthritis, osteoporosis and chronic muscle and joint pain. You can get up and get active in luxurious style like never before. You will not regret adding a spa to your Tampa Bay pool when you see your loved ones able to be active once more. Our world is a fast moving, fast paced ride. We run from place to place day after day, causing our stress to go through the roof. A spa is a chance to get away form it all. The heat combined with the pressure of the jets will melt your day away, allowing you to unwind to a level that previously was inaccessible to you. Spend time with the kids or plan a romantic night with your significant other. Either way, you will be calmed and relaxed by the time you step foot out of your new spa. 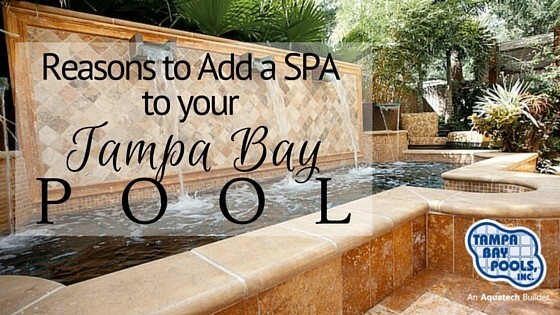 If you are ready to add a spa to your Tampa Bay pool, we can help. Take a look at our gallery or contact us today to get started.